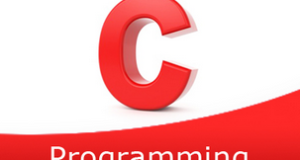 C program to count the frequency of each character in a string – In this article, we will describe the numerous means to count the frequency of each character in a string in C programming. As you can see, firstly, you need to enter the particular string for which you want to check the characteristics for. Read the string entered by the user and store the string into the variable ‘s’ using gets(s). 2) The for loop iterates through the string with the structure for(j=0;s[i];j++) until the last character of the string becomes null. a) Initialize the j value to the variable n.j indicates the length of the string. a) The outer for loop iterates through the string with the structure for(i=0;i<n;i++),for each iteration it selects one element s[i]. b) The inner for loop compares the s[i] with remaining elements of the string using for loop with the struct for(j=i+1;j<n;j++).If it matches then increase the count value. c) Print the count value which is the frequency of the selected element s[i]. 2) The main() function calls the function printfrequencyofcharacters(char *s) by passing the string as an argument to the function. 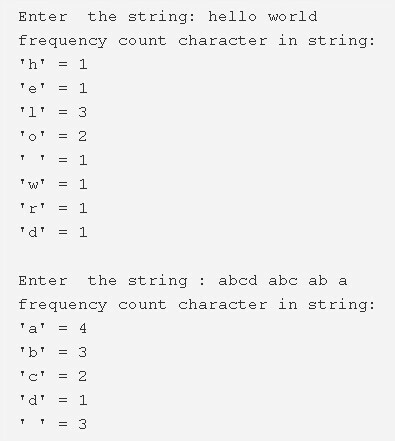 3) The function printfrequencyofcharacters(char *s) prints the frequency of each character of the string. The outer for loop iterates through the string with the structure for(i=0;i<n;i++). a) For each iteration of the outer for loop, the inner for loop will compare the s[i] with the remaining characters of the string. b) If s[i] matches then increase the count value and print the count value of s[i] which is the frequency of s[i].